The Laser Classic collection from Dumas is the best of both worlds. The technology and precision of laser cutting combined with our ever-popular Chris-Craft line. The Classic Collection premiers with the introduction of three new kits. They are the 1929 Chris-Craft 24 ft. Runabout, kit #1701, the 1949 Chris-Craft 19 ft. Racer, kit #1702, and the 1938 Chris-Craft 27 ft. Triple Cockpit Barrelback, kit #1703. 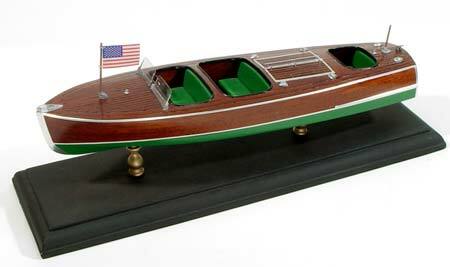 The Classic Collection kits feature laser cut balsa and mahogany parts, peel and stick decal set, display base with pedestals, step-by-step instructions, and a complete set of cast urethane deck fittings. These static display models will look great in either home or office and are great kits for every level of model builder.